“OMFG” may be an over used cliché but OMFG! I’ve finally got round to picking up some of Black Sun‘s 75mm barbarians. I am so impressed, I have decided to do a bit of a box opening post at a review of the miniatures contained therein. 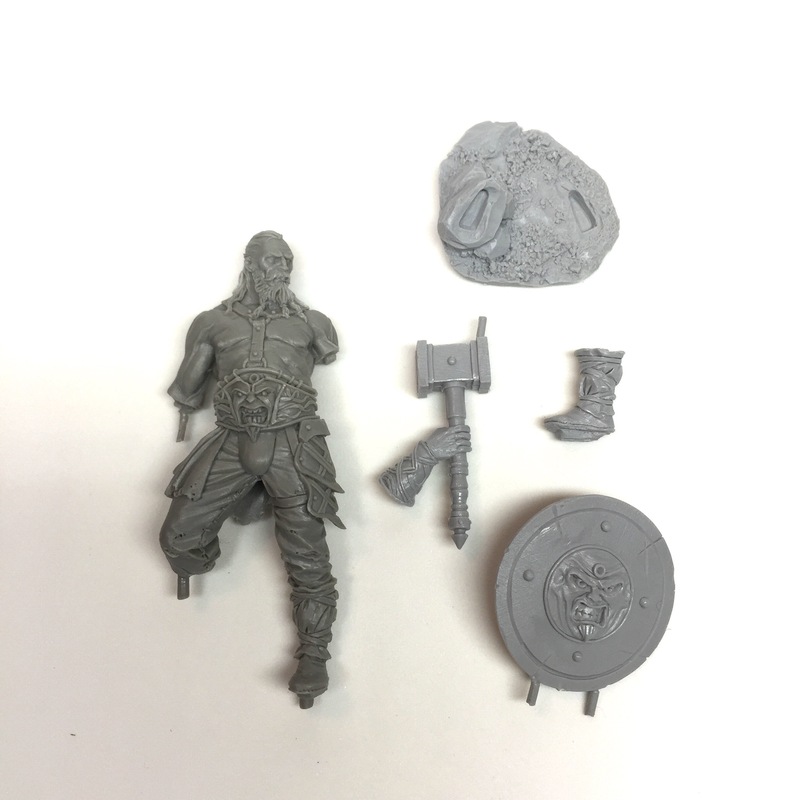 To keep this balanced (as I do love my barbarians) I am including photos of any and all flaws in the casts and all the components along with the packaging so you can see exactly what you will get. All of these miniatures have been sculpted by the outstanding Joaquin Palacios (AKA Freeman) and are absolutely cracking! All of these miniatures come packed in sturdy cardboard boxes with foam inserts. “No frills” packaging really and comes with none of the art cards, stickers or other paraphernalia that I have become accustomed to, but the quality of the miniatures themselves really makes up for that. They are all resin, beautifully cast by GRX Creations. There are a few mould lines and other imperfections but nothing too concerning – I will go into the cast quality specifically for each miniature. Let’s start with a guy you might recognise – this is the 75mm version of the 35mm Old Barbarian I painted for Black Sun Miniatures. There are a small number of mould lines on the figure as can be seen in the above photos, but they are really not to much of an issue. Somehow they only run through areas with little/no detail such as the side of his arm or the flat of the hammer. The mould lines seem to stop or at least greatly reduce when going through textured areas such as fabric and hair. Its really weird as they would normally go all the way, but I am pleased to say that this guy should be a really straight forward clean-up. Next up, two miniatures in one, Barbarian and the lost princess – a grizzled barbarian with a damsel in distress thrown over his shoulder. This is a classic archetype, the sort of thing you might expect from a Boris Vallejo or Frank Frazetta painting and it has all of the details and character that I would expect from Vallejo, Frazetta and indeed Joaquin Palacios. 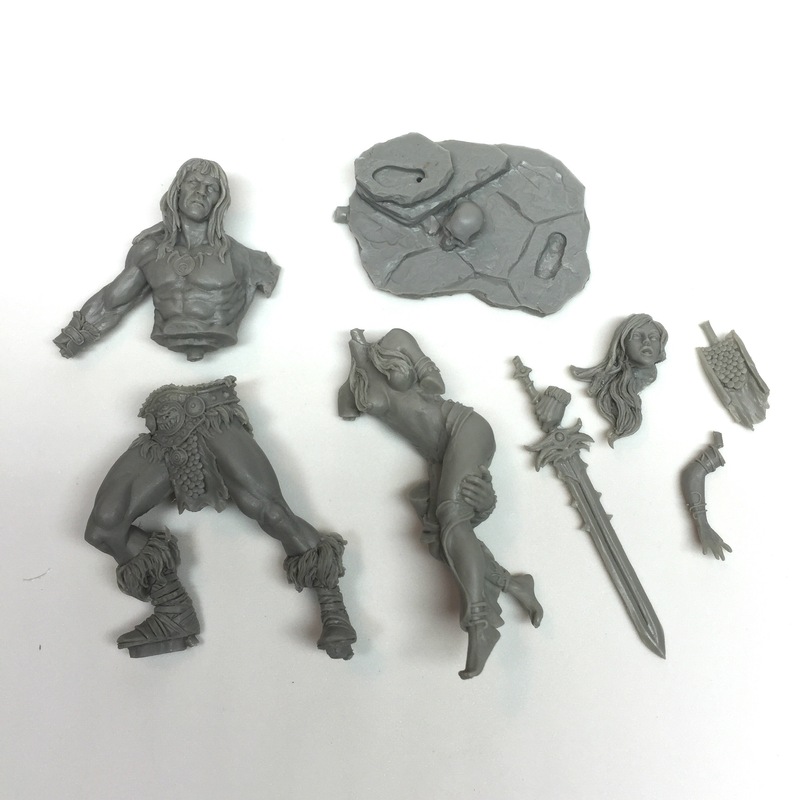 More pieces involved in this kit, 4 pieces to the barbarian (upper body, legs sword hand and rear cloth), three pieces to the princess (body, head and left arm) and the base. Both faces have great features with a lot of character and will be a lot of fun to paint – especially trying to differentiate the colour of the flesh of the barbarian to that of the princess. In terms of cast quality, there are very few issues with this kit. the underside of the barbarian’s right thigh has some tiny bubbles and slight mould lines, and there is a tiny crack on his right knee, but it has been tricky to find any other issues! 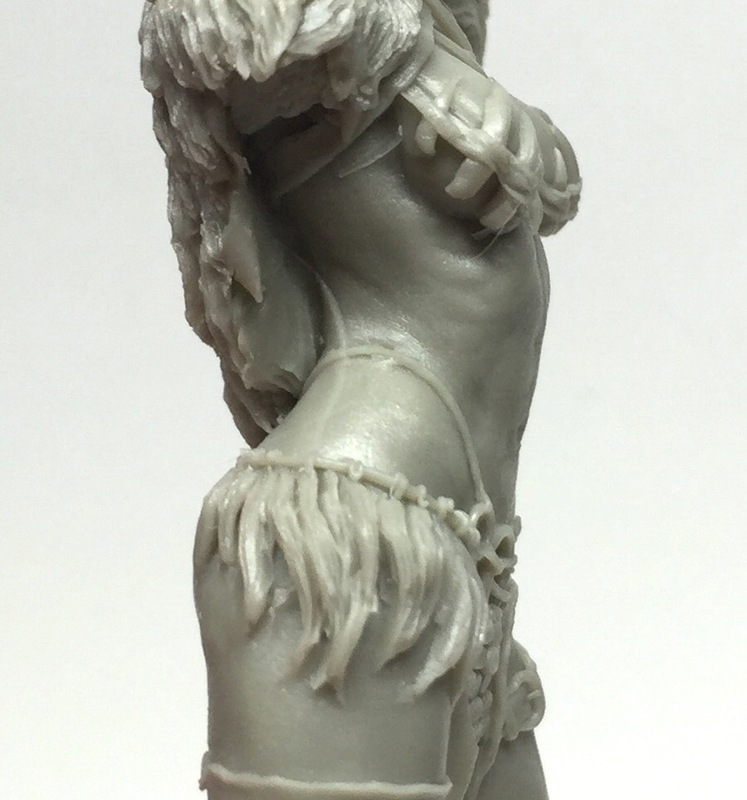 The final kit I’ve got is “Savage Beauty” – a beautifully detailed Amazonian warrior. Out of the three kits, this one is the most finely detailed – so many different textures and materials from fur to feathers and metal to leather there is so much that could be done with this miniature. The features on this model are fantastically delicate and the details of her (limited) clothing and various accoutrements are very fine indeed. There are 7 pieces to this kit – the main body, left arm with sword, right arm with huuuuge axe, scabbard, 2 horns for her helmet and the base. In terms of mould lines – the only thing of any consequence is a slight mould line between her hip and the cloak which running a knife along should sort out nice and quickly. All in all, these three kits are phenomenally well sculpted and beautifully cast and I would highly recommend them to anyone wanting to paint some great 75mm figures. I must also say that 75mm sounds a lot scarier as a scale than it really is – any of you 30mm only painters who fancy a challenge, you could be a lot worse off than trying one of thee guys. If you have any questions about the kits or this post, please don’t hesitate to ask.